Aylostera densipectinata KK489 Jucanas, Tarija, Bolivia 2800m (3000m) (Kníže) hort. Aylostera heliosa var. melanistic KK489 Jucanas, Tarija, Bolivia 2800m (3000m) (Kníže) hort. Rebutia heliosa var. melanistic KK849 Jucanas, Tarija, Bolivia (2800-3000 m) (Kníže) hort. Sulcorebutia densipectinata KK489 (Kníže) hort. Rebutia densipectinata KK849 f.ma brevispina hort. Rebutia heliosa var. melanistic KK849 cv. Short Spines hort. Aylostera heliosa var. condorensis hort. 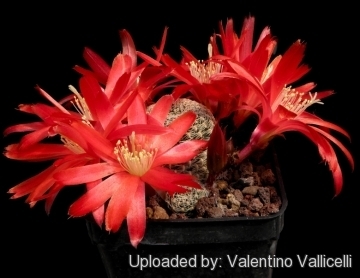 Mediolobivia heliosa var. condorensis hort. Rebutia heliosa var. condorensis f. cristata hort. Rebutia heliosa f. cristata hort. Rebutia heliosa f. monstruosa hort. 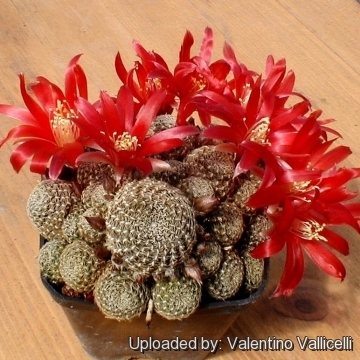 Rebutia heliosa var. solisioides hort. Aylostera heliosa subs. theresae hort. Rebutia heliosa var. teresae (Kníže, Říha & Šeda) hort. 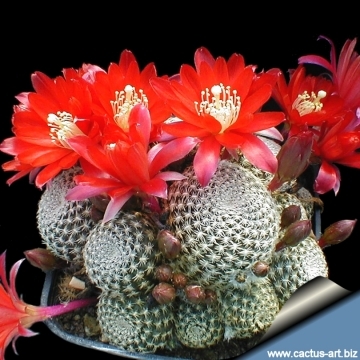 Rebutia teresae var. flavida hort. Aylostera deminuta var. teresae f. flavida hort. Rebutia heliosa var. condorensis cv. albispina hort. Rebutia heliosa var. condorensis cv. brunispina hort. Rebutia heliosa var. condorensis cv. rubrispina hort. 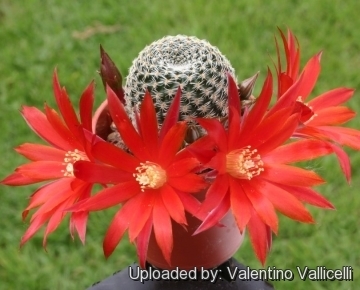 Description: Rebutia densipectinata is essentially a miniature plant similar (if not the same) to Rebutia heliosa var. condorensis. It readily forms a clustering mound of tiny heads with white to tan coloured pectinated spines and dark red flowers. 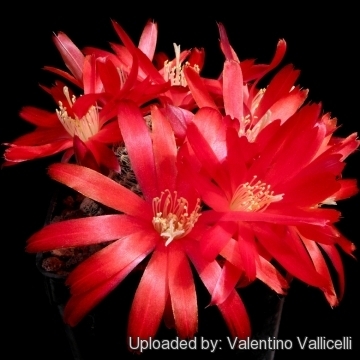 Remarks: Rebutia densipectinata is very often confused with Rebutia albopectinata a "Mediolobivia" not related with Rebutia heliosa, and most of the plants labelled "albopectinata" are indeed "densipectinata" (syn: Rebutia heliosa var. condorensis). Stem: Heads 2.5 cm wide, rarely higher than 3 cm or more. Flower: Large dark-red, funnel-shaped, long-necked, 4 cm in diameter, 5 cm long. Blossoming time: Profusely flowering in spring. Rebutia densipectinata KK849 f.ma brevispina hort. 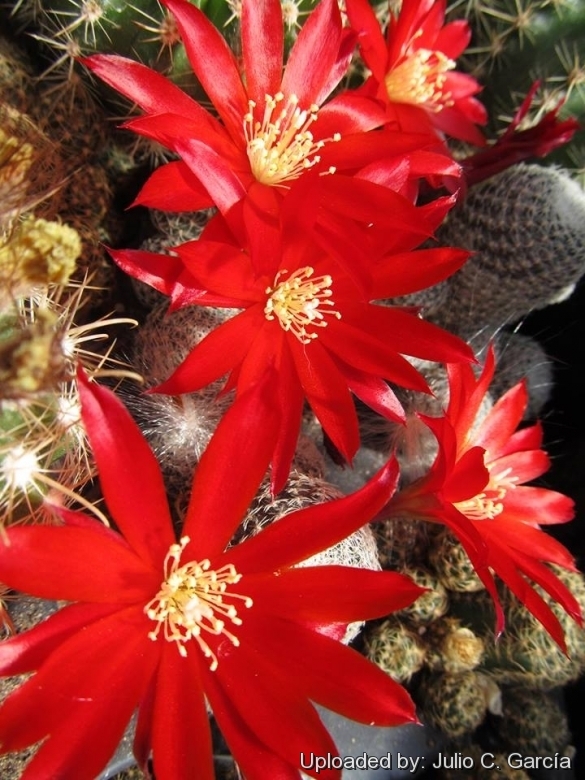 : This is one of the most remarkable red blooming Rebutias with short, tiny silvery brown spines and purple tinged stem reminding of Sulcorebutia rauschii. Rebutia densipectinata KK849 Jucanas, Tarija, Bolivia 2800m (3000m) Kníže non F.Ritter: (same as: R. heliosa var. condorensis and var. melanistic?) forms a mound of tiny heads covered by white to tan coloure pectinated spines. Blossoms bright red. Rebutia heliosa Rausch: It is a miniature plant that readily forms a clustering mound of tiny heads. 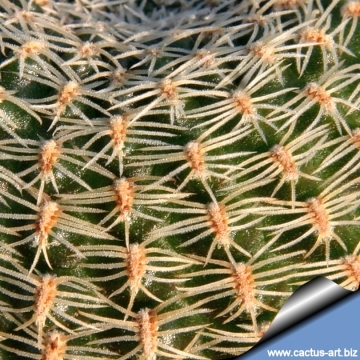 The spines are very short, silvery, dense and pectinate, covering almost completely the small stems in a spiral pattern. Blooms orange. Rebutia heliosa var. condorensis Donald: The variety “condorensis” specifically describes the clones of the species with dark red flowers, and larger heads. Distribution: Condor pass. Rebutia heliosa var. condorensis f. cristata hort. : Crested form. Rebutia heliosa f. cristata hort. : The crested stems are 2,5-4 cm thick and eventually forms a brain-shaped clump 10 to 20 cm across. Rebutia heliosa f. monstruosa hort. : each branch, after an initial normal growth, go crazy and starts to produce bumped structures or even dichotomize funnily. This odd cactus is very distinctive. Rebutia heliosa subs. teresae Kníže, Říha & Šeda: It is a long-spined form. The spines are not quite as appressed and the areoles are not as elongated. The flowers are more intensely red-orange. Distribution: Cajas Pass, near Nogales, North West of Tarija. Rebutia heliosa cv. Yellow: albinos form. Cultivation and Propagation: These plants come from mountainous areas, so like bright light, cool and dry conditions in the winter; this is important for the flowers as well as for their health. Without this cool winter period (0-10° C) they normally wont get many buds. They have thick taproot and are of difficult cultivation and rot prone because of a great sensitivity to the excess of watering, not easy to get to any large size on their own roots really a challenge to grow into a large clump. 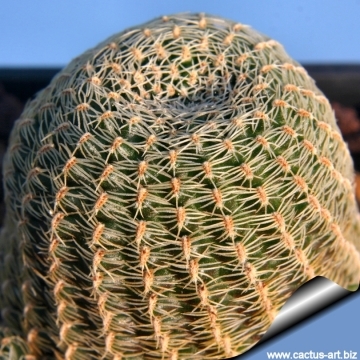 They are commonly grafted to avoid root problems and to make easier to grow. Sun Exposure: Suited for sunny-brightly exposure; can tolerate light shade. Cultural Practices: Suited for airy exposures. Needs deep pot and good drainage to accommodate its tap root. It is very cold resistant as low as to -10° C or less for short periods of time. 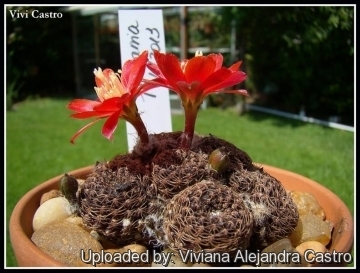 It is a fine plant for a rock garden or container, contrasts well with agaves, yuccas, and low-growing flowering plants. Pests & diseases: R. heliosa is especially prone to root rot, therefore, underpot in a smaller container filled with very porous compost. Propagation: Cutting as it branches freely from the base; Also can be grown from seeds or graft. Seeds can be sown in the spring or summer. The seedlings should not be disturbed until they are well rooted after which they can be planted separately in small pots.